Skip Hop recalls Tuo Convertible High Chairs due to the front legs on the highchair can detach from the seat, posing fall and injury hazards to children. This recall involves the charcoal colored Tuo convertible high chair, which can be converted into a toddler chair. The style numbers are 304200 and 304200CN with a date code found on the back of the chair as follows: HH102016, HH11/2016, HH3/2017 and HH4/2017. 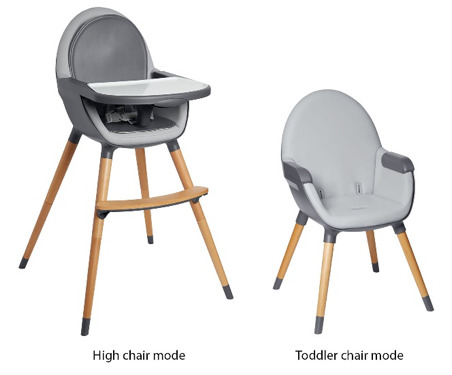 The highchairs have a reversible seat pad, removable tray, 5-point harness, beechwood footrest and legs. 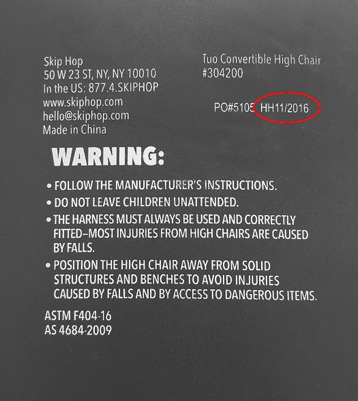 Consumers should immediately stop using the recalled high chairs and contact Skip Hop for a free replacement. Consumers can contact Skip Hop toll-free at 888-282-4674 from 9 a.m. to 5 p.m. ET Monday through Friday, or online at www.skiphop.com and click on “Recalls” for more information. The high chairs were sold at Babies ”R” Us, Buy Buy Baby, Target, Kohls, Dillards and other children specialty stores nationwide and online at Amazon.com and Skiphop.com from December 2016 through September 2017 for about $160.